Sruell is a townland in the parish of Killymard. Ir. sruthail is a feminine noun meaning 'stream' derived from sruth, though rather less common than sruthán. Binnasruell is the 554th highest place in Ireland. 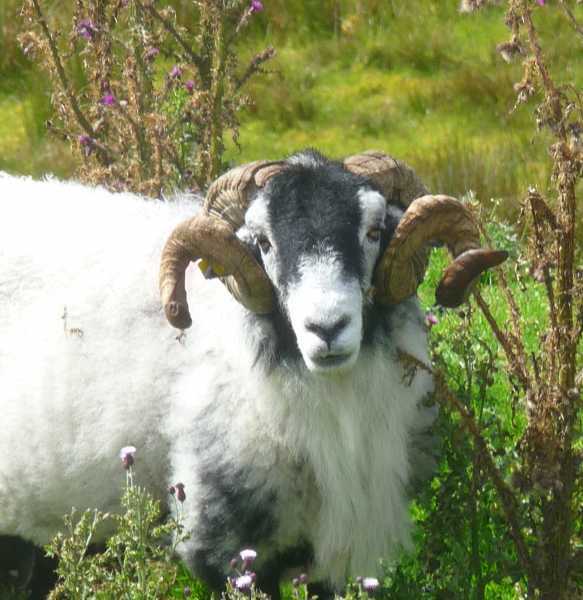 Picture from garrettd : Impressive curly-horned Bluestack sheep. Picture: Impressive curly-horned Bluestack sheep. A peak best left for dry summer conditions. A slightly tortuous start( from a gateway at G893884 A) to a horseshoe walk taking in Binnasruell, Silver Hill, Cullaghcro and Carnaween. I noted that many previous posters on this summit had been here in winter and was hoping that the generally sodden underfoot conditions would have improved after another "good" Irish summer.